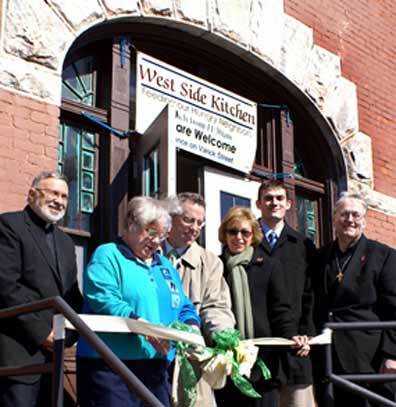 UTICA, NY, March 17, 2008 -- A ribbon-cutting on Monday, March 17, marked the grand opening of Mother Marianne’s West Side Kitchen, a soup kitchen serving the poor and homeless out of St. Joseph-St. Patrick Parish Center at Columbia and Varick streets. The soup kitchen is named after Blessed Mother Marianne Cope, who grew up in West Utica and went on to devote the last 30 years of her life to the lepers of Hawaii’s Molokai. The all-volunteer operation serves soup and sandwiches from 11:30 to 12:30 Monday through Friday, and a bag lunch on Saturday. 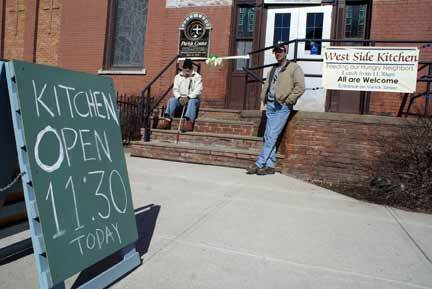 On Sunday the parish offers a coffee hour following the 10:30 Mass. 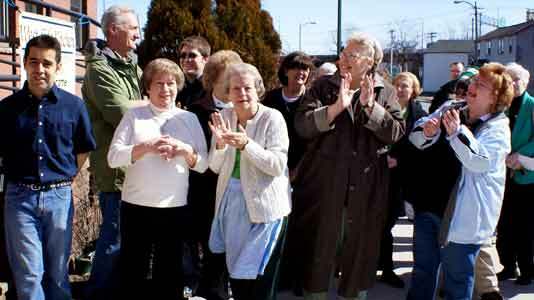 A week-long soft opening preceded the grand opening to allow the training of scores of volunteers. Officiating at the ribbon-cutting were Deacon Gil Nadeau, Parish Administrator Fr. Richard Dellos, Oneida County Legislator Rose Ann Convertino, Utica Urban and Economic Development Commissioner Robert Sullivan, and Linda Croghan and Michael Arthur from State Senator Joseph Griffo’s office.